Bremerton Municipal Court Judge James Docter swears in the city’s three new police officers Wednesday. Photo by Shannon Corin. 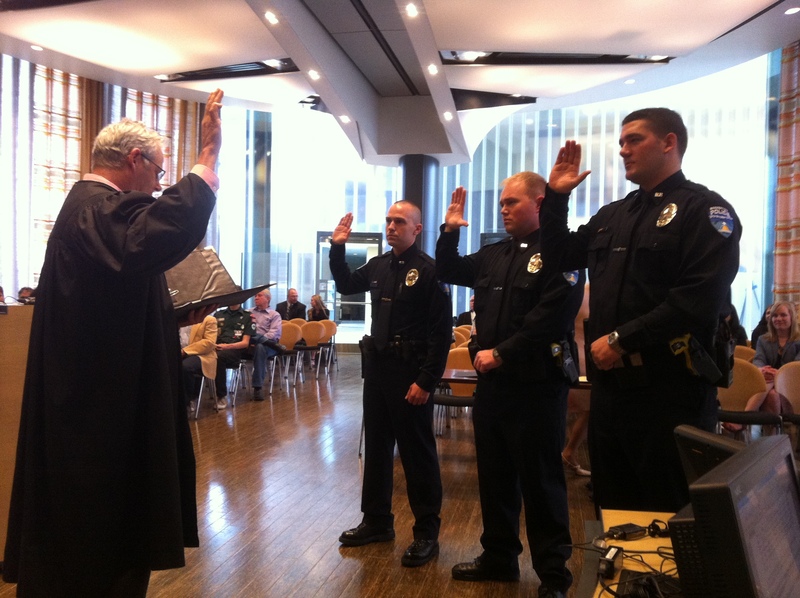 Three new Bremerton police officers were sworn in Wednesday, a shot in the arm toward the department’s staffing levels. At its height in the mid-2000s, the department had 66 fully commissioned officers, but budget cuts in recent years took that level down into the low 50s. That has meant reductions in investigations and overtime for patrol officers, who attempt to keep up with the city’s 911 call volume. The three officers sworn in, along with another new hire and a position yet to be filled, will bring the department back up to 57 fully commissioned officers, according to Bremerton Police Chief Steve Strachan. Beau Ayers, a graduate of Ohio University, formerly worked as a police officer in Nelsonville, Ohio and with the US Border Patrol before coming to Bremerton. Joeseph Corey, a South Kitsap High School class of 1998 grad, served five years in the army as a police officer in South Korea, at Fort Lewis and in Iraq. He was most recently a Department of Defense police officer at Joint Base Lewis-McChord. Christopher Faidley, who grew up in Seattle, graduated from Whitman College in 2009. He enlisted in the National Guard in 2011 and has also worked for an electrical contractor and for Microsoft providing security. The three have graduated from the state’s law enforcement academy and are currently training with veteran officers in the department for the next four months. It’s not always easy for the police around here to identify a suspect, particularly a shifty one. But a new tool, made possible by grant funding, makes it a little easier. Cops often have trouble figuring out who someone is, particularly if they don’t provide any identification on them (or they do, but it’s bogus). They’ve long had to rely on a physical description for such folks, and that doesn’t always mean they’re able to successfully figure out who they are. A pot of $300,000 later, and now everyone’s mug — at least those of us with Washington state driver’s licenses — is available to a police officer in his or her patrol car’s onboard computer. Officials are quick to tout the potential benefits. A person who successfully lies about their identity could be covering up the fact they have a warrant for their arrest, for instance. The system should be in place for most law enforcement agencies around the state by November. (Olympia) – A common practice for a criminal when asked by the police for their name is to use a false one. But, it just got easier for police to confirm a suspect’s real identity. Previously, police officers had to rely on text descriptions of physical characteristics to make a positive identification. New computer capabilities now give police throughout Washington the ability to retrieve driver license photos. Police can use their in-car computer to quickly and efficiently confirm the identity of the people they contact. A $300,000 grant through the State, Regional and Federal Enterprise Retrieval System (SRFERS) project and from the Washington Auto Theft Prevention Authority (WATPA) has made it possible for police officers to quickly confirm an individual’s identity with a copy of a Department of Licensing photo. Lewis County Sheriff’s Office is the first agency in the state to have the ability to view DOL photos through the State Patrol’s A Central Computerized Enforcement Service System (ACCESS). Most law enforcement agencies in Washington will have the capability to view driver license photos through ACCESS by November, 2011. “We are very thankful for this emerging technology. Our office has been progressive in keeping up with ever changing technology and utilizing it to keep our community safe,” said Lewis County Sheriff Steve Mansfield. “Having DOL pictures instantaneously will help us in a lot of ways, including identifying people for criminal investigations, traffic stops, hit and run collisions, and helping identify missing or lost people,” he explained. The grant funding by SRFERS gave many states outside of Washington including, Oregon and Idaho the ability to share driver license photos through the ACCESS system. The funding by WATPA gave police agencies from around the state the same ability to use the system to quickly retrieve a copy of a driver’s license photo and make positive identification. The ACCESS system is managed and operated by the WSP’s Criminal Records Division and is designed to give law enforcement the ability to query multiple state and national databases as a tool in the administration of criminal justice. Since August 2010, business owners in the City of Port Orchard have been victimized by graffiti. 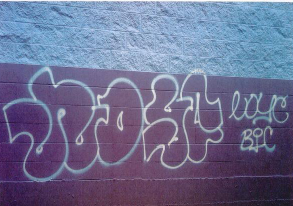 The following are tagging monikers that have been spray pained throughout the city: ELFRO360, ABORT, ZAP, DOS1, TOY, JSK, BIC, IRG, CASL, NGST, NOYC. Crime Stoppers of Puget Sound will pay up to $1000 for information leading to the arrest and felony charges against the participants in this despicable and costly crime. Call 1-800-222-TIPS if you have ANY information.